Location: East exterior wall of 10216-106 St.
Look up! 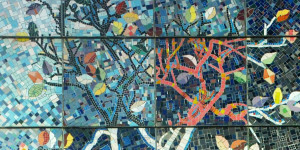 Twelve thousand individual pieces of tile compose this 12 x 20-foot mosaic. Blue Chair Café owner and Red Seal chef Harold Wollin united with artist Zoe Bacchus and architect Sherri Shorten to form an eclectic artistic team to create this work. Community Partners: Ames Bros. Distributors Ltd.